"Norway is an important centre of marine innovation and several foreign companies have operations there, too. 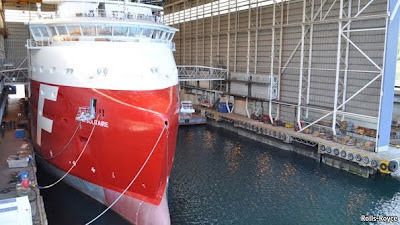 One such is the marine division of Rolls-Royce, a British firm, which is collaborating with Farstad, a shipping company based in Alesund, and STX OSV, a shipbuilder. The result of their efforts is Far Solitaire (pictured above), the first of a new class of vessels which bristle with novel technology that promises to make shipping safer, cleaner and cheaper." "Wärtsilä put together a presentation recently that evaluated a number of new technologies and design concepts aimed at cutting operating costs, while at the same time reducing ship emissions."